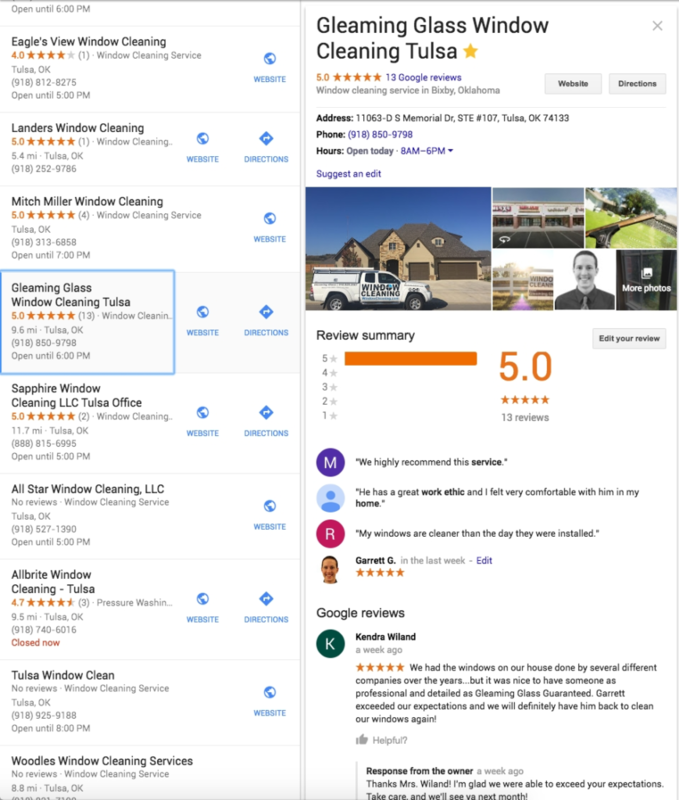 We could not be me more proud of reaching this milestone because we know our happy customers made this happened, with people like Kendra Wiland who left this Google Window Cleaning Tulsa Reviews on Google: “We had the windows on our house done by several different companies over the years…but it was nice to have someone as professional and detailed as Gleaming Glass Guaranteed. Garrett exceeded our expectations and we will definitely have him back to clean our windows again!” So gleaning glass wants to give a huge shout-out and thank all of our fantastic customers for sharing their experiences, with tulsa’s most highly reviewed window cleaning company in tulsa. I value very much what you have shared on the internet because it helps us to better serve you and other people looking for window cleaning Tulsa services. Many people that Tulsa area, I included, rely on Google Window Cleaning Tulsa Reviews and other review sources to make an informed decision when choosing between different service companies or products to use. When our customers leave Google Window Cleaning Tulsa Reviews for gleaming glass, it helps people find us whenever they search Google for key terms such as Tulsa window cleaning, window cleaning Tulsa, window cleaners in Tulsa, Tulsa window cleaners, window washing Tulsa, Tulsa window washing, window cleaners, glass cleaning Tulsa, Tulsa glass cleaning comma and window cleaning companies in Tulsa. If they search for any of those terms, we are bound to come up at the top of page 1 due to all the 5-star Google reviews we’ve accumulated over the years. And it’s all thanks to our awesome customers! The instant estimate feature is no obligation, and completely free. If you’re just curious about what we might charge you to clean your windows feel free to swing by our instant estimate software tool on our website and get pricing with no obligation to schedule your cleaning. However, if you would like to schedule a cleaning because the pricing looks good deal, simply select a cleaning package that works best for you and click the schedule now button. The software we are currently using is rumored to be updated soon so that you can also schedule your cleaning within the software form. We mean that quite literally. You will actually be able to book yourself into our schedule by being able to see which days we have available in the coming weeks and then you can select a time and date that works best for you and then book it right there. Exciting times lie ahead. This new updated feature is going to save our customers and us a lot of time. We will no longer have to call the customer and a customer will have to call us back and forth back and forth just to schedule a time to go out and give the estimate and then to also schedule a time to do the actual cleaning. We are super pumped and can’t wait to see the future revealed. The owner of the software company that makes it for us said they are only a couple of days away from releasing it.